If you have not had a chance to pick up this SUPER FUN necklace on Amazon, don't miss out! 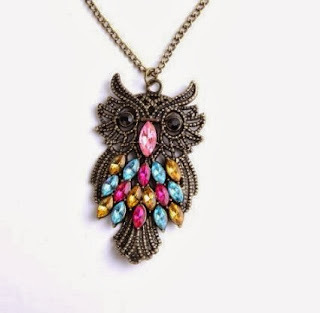 The Antique Colorful Crystal Owl Long Pendant Neckalce is ONLY $1 Shipped. This is one of my FAVORITE necklaces to wear. There's not a time wearing it that someone has not asked me where I found it! Looking for a GREAT gift??? Here's a SUPER SCORE idea!